now i am sure none of us respond well to the expression "dumb bunny...." but come on guys. it's 102 degrees outside! why do you lay on top of each other, and why do you let each other do this?!?!? sorry for the quality of this image but i'm sort of forced into phone photos for now. i'll dig through the archives soon and get you some quality shots...i just didn't know anyone missed us....wink wink. we respond well to peer pressure and nagging, so if we disappear again just send us a "WTheck" note! Will need to try to keep you on track. Yeah, I don't know why they do that either, but they always do! Sage says the reason is because bunny fur wicks heat away from the body and Bells doesn't have enough fur of his own to do a good job, so he's borrowing some of Nuage's. Only ~90F here .. and Sage is flattened. That may have something to do with the 10C jump in temperature to get here. Not to change the subject but I think this is a great photo-love the lighting and the colors! 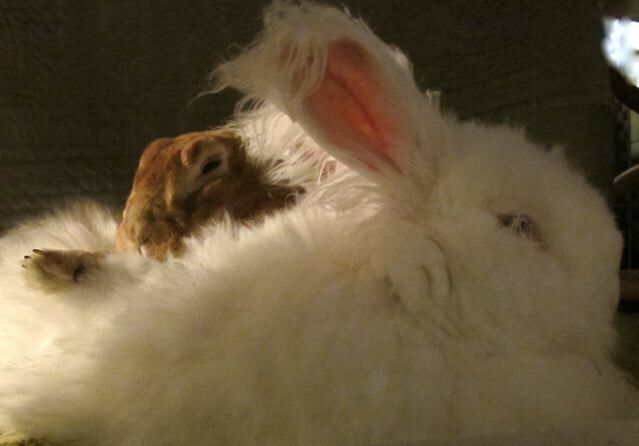 My Mr. Jamal always lays on top of his bunwife Miss Luna. Just the tip of her nose and a bent over ear are visible sometimes. I feel so sorry for her, but she's much bigger than he is and could easily knock him off if she wanted. He loves her tremendously, so I guess she puts up with the little inconveniences.